We are a culture obsessed with weight. Whether you feel too fat, skinny, flabby, chubby, chunky, emaciated, huge, brittle, etc… We have almost as many names for our obsession with weight as Eskimos have for snow. This distraction causes needless suffering ever year, and too many victims to count. There are many, many schemes touting the cure to being obese, or ways to get ripped, or how to look great in a cocktail dress. It’s a billion dollar industry, and only getting larger every year. From yoga aimed at helping lose weight, to dangerous drugs and techniques, we spend countless hours and money on becoming an image of what we think we should be. While this is ridiculous, and there are findings out there that suggest that there is nothing inherently wrong with being overweight, like The Obesity Myth by Paul Campos, we are nevertheless obsessed. The key word is obsession. If we obsess about something, that word in itself may lead to the answer. If we are concerned, worried, obsessed, uncomfortable, or even disgusted with the way we look, or worse, the way others look, we need to look inside ourselves. We are suffering for it, and need to get at the root cause. Mindfulness might hold the key to unlocking our biases and ultimately our suffering in relation to the body aesthetic. Meditation can help us get at the root of our subconscious minds, and ultimately help us to come to terms with the cause of our displeasure, in this case, relating to weight preoccupation. 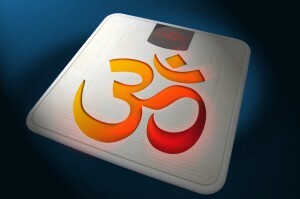 Mindful awareness of this can then help us rid ourselves of our judgmental attitudes toward weight and the human body. This is the real meditation for weight loss. I came across a recent press release titled, “Lose Weight by Practicing Meditation for Just 10 Minutes a Day!” by Dr. Harsimran Singh. I found myself immediately judgmental and skeptical in the title. I guess I’m conditioned to hold meditation and mindfulness in high regard, and to see it being used for something like weight loss just irked me. Still though, I had to read it, and found it quite the opposite. It’s insightful and might just work for some people. While I don’t agree wholeheartedly that gaining excess weight is a direct result of bad habits, but could be a myriad of different things, I do agree that if one wishes to change their body, it all starts with the mind. Gaining access to your subconscious through meditation can have a profound impact on your behavior going forward. You can reprogram your mind and change limiting thoughts, and break beliefs. This will give your the power to affect real change in yourself, and through changing yourself, you can help others. Dr. Singh is offering free phone conference is anyone is interested (I get nothing from this, just passing along information). You can find it here if you want howtobehappysite.com – I get nothing from this, just passing it on. For those who want a more direct approach, there’s always this.